When Jan's daughter asked her to make curtains for her kitchen from Coca Cola fabric, she was more than happy to do so. 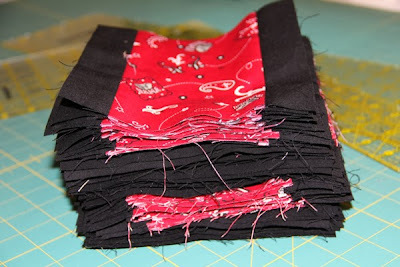 Once she finished making as many accessories as she possibly could with the leftover fabric, though, she was sick of it and never wanted to see it again. 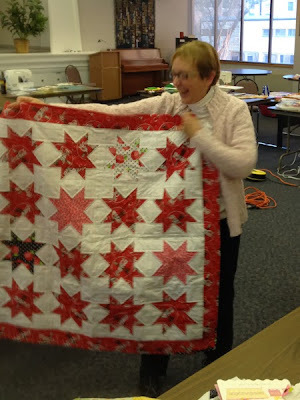 Being the generous friend that she is, she managed to lose it to her quilty friends in the form of three-inch strips playing Left-Center-Right at quilt retreat. Being the fun friend I am I secretly gathered them up from everyone thinking that some day I would make her a fun surprise from them. 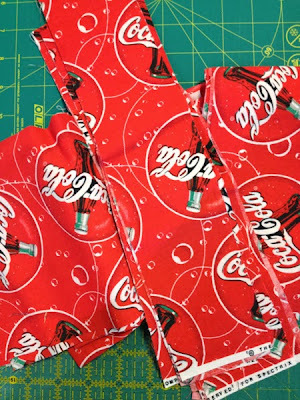 Nothing needs a fun surprise like a first-time Gramma so when Jan found out her Coca-Cola loving daughter was (FINALLY!) 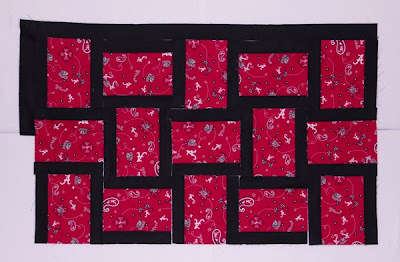 expecting a baby, I knew I had to make a baby quilt. 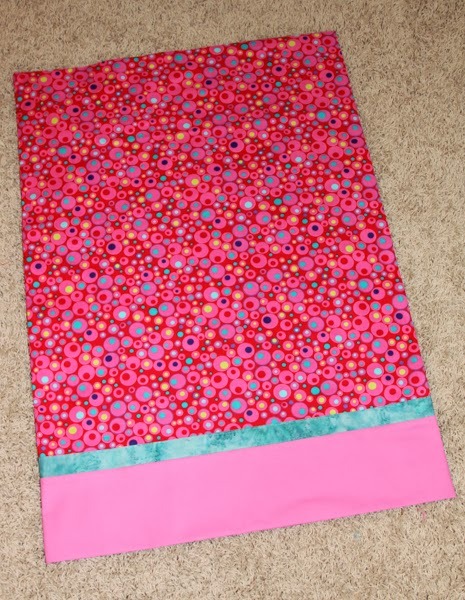 I wanted to use up as much of the fabric as I could, but I also wanted to add a few more fabrics for interest. 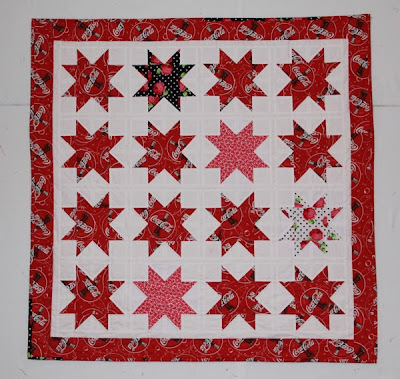 I decided on something from the Michael Miller Tea Room collection and just made Sawtooth Star blocks. Originally I planned to use the Apron Ruffles print for the borders but just used it as the backing instead. 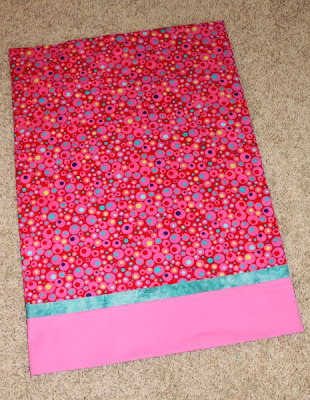 I did use up almost every last bit of the fabric. 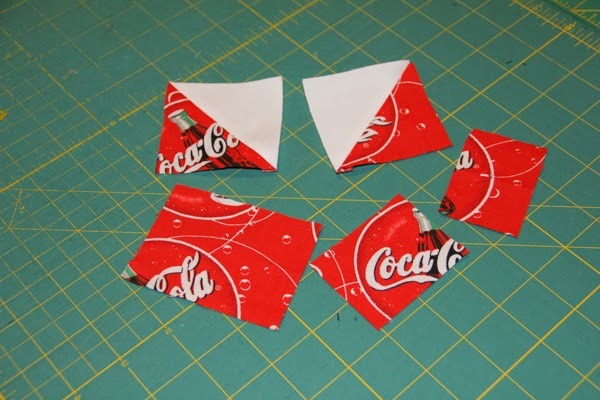 When Jan's little grand-daughter, Rose Mary Jean, was born I sent the leftovers to her in a card in case she wanted to make something else from them. She thought that was funny! She thought the whole thing was funny! 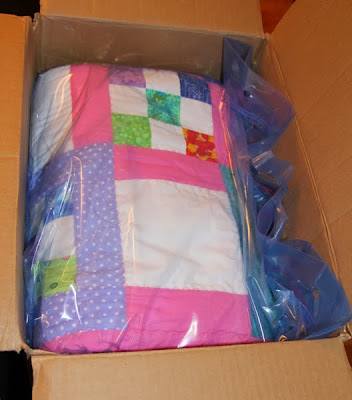 But she really does love her "Fun at Gramma's" quilt ……..
…….. and I think little Rose Mary will too! Progress -- Aidan's Quilt is a Top! 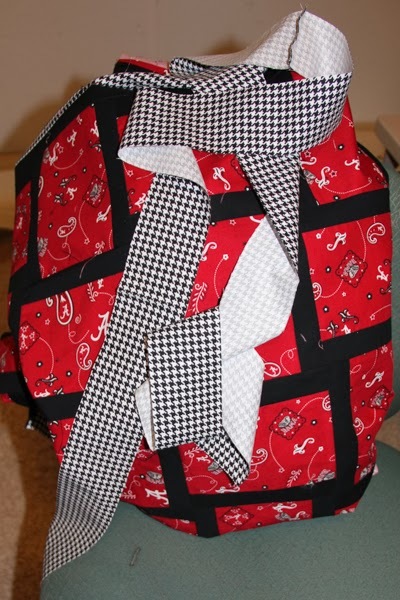 For some reason I have been really motivated on this project and have Aidan's quilt already into a top. Using a pretty easy pattern helps, but the fact that Aidan checks on my progress whenever he's here doesn't hurt! The blocks go fast and stacked up pretty quickly. 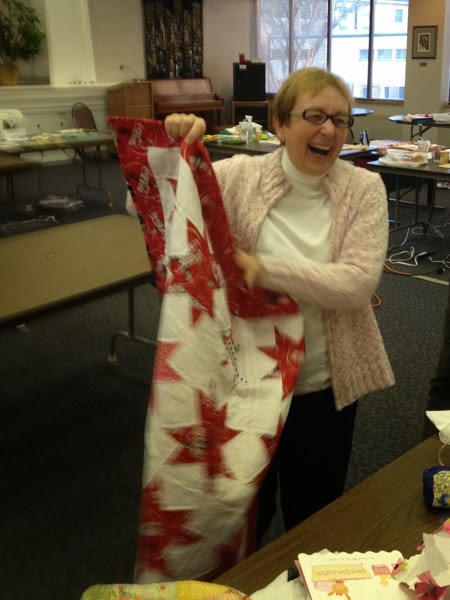 Getting to spend time sewing with friends one day last week helped, too. I got all the strips made and most of the rows put together that day. 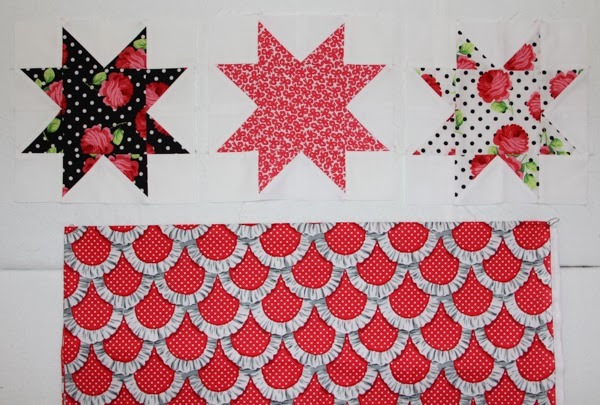 This is such a fun quilt. I really love the way you "see" curves but all the seams are straight lines. Putting on the first black inner border made it really float. If this is to be a real Alabama quilt I needed to get some Houndstooth into it so I ordered that from Fabric.com. Once again, I am happy to report great service. Not only was it delivered within a few days, but apparently they have an "end of the bolt" deal. 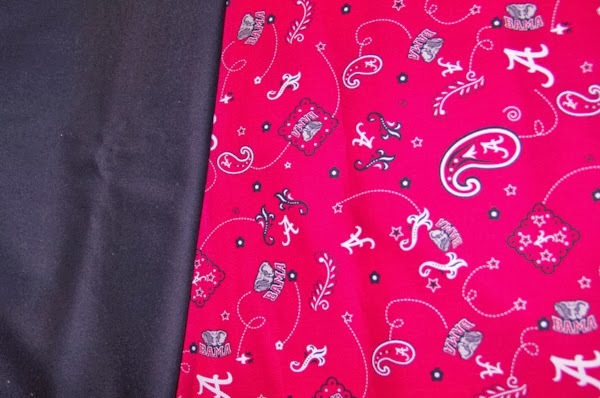 I got an extra 17 inches of fabric. Can't argue about that! I had found another Alabama print (online of course!) 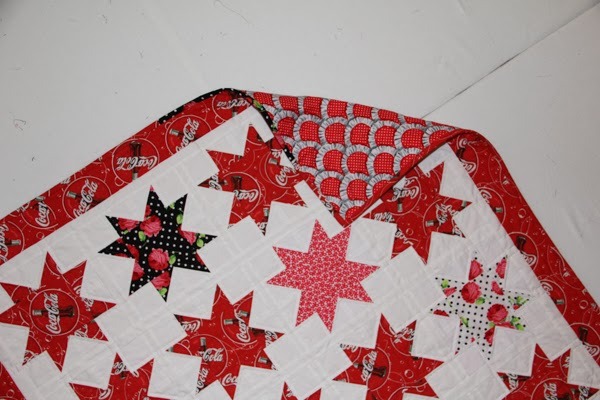 which I used for the final border and got the top finished today. I'm pretty pleased with this one. 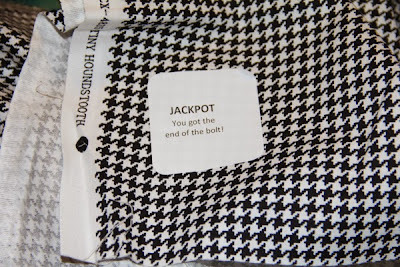 I'm going to cut the binding from what's left of the Houndstooth fabric and use everything else that's leftover for a pieced backing. The next time Aidan is here to check on my progress he'll have a surprise! 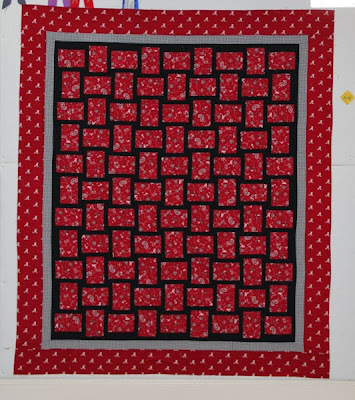 It's already time to share my October project for the 2013 NewFo Challenge. 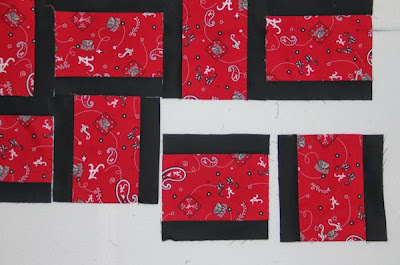 A few weeks ago my grandson, Aidan, asked me to make him an Alabama quilt. (As in the football team -- The Crimson Tide.) The last quilt I made him was his Star Wars Quilt in March 2011. I was thinking that one would keep him happy a little longer than this, but my grands can ask me for just about anything these days. (Well.....since always, I guess!) The only fabric I could find locally was this print which I paired with my favorite black, Michael Miller Jet Black. 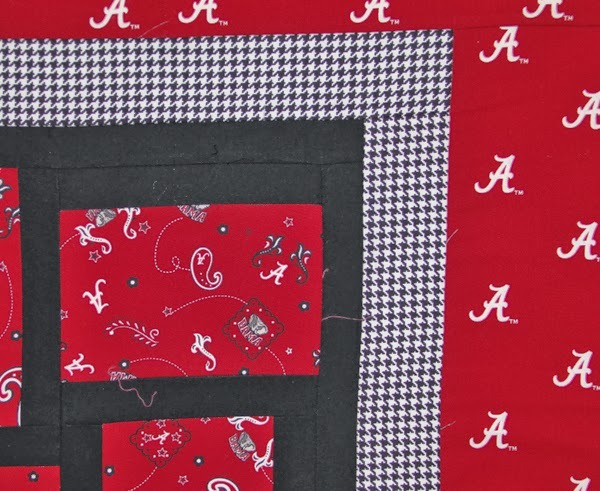 Since it was the only Bama fabric my local quilt shop had left I was really hoping Aidan would like it. He was here the other day and in a very casual way said, "I really don't like Star Wars anymore." Where did that come from? Could he possibly be thinking about the quilt he had asked me to make? I told him that just happened to remind me that I bought some Alabama fabric and got it out to show him. He looked at it closely, thought about it, then gave me a "thumbs up" and said, "Good job!" Whew! Good for me. 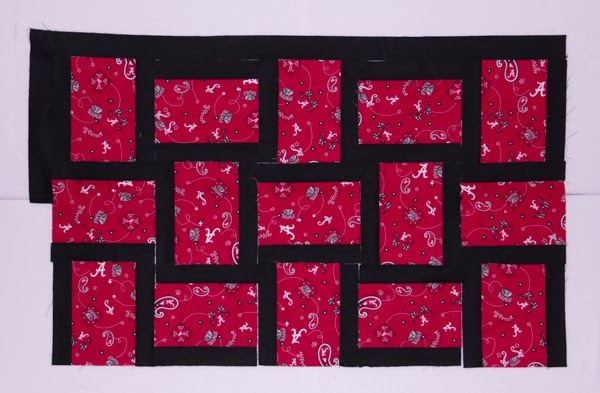 I decided to keep the quilt pretty simple (he's only 7 after all!) so went with one of my favorites - "Over and Under" by Paula Hughes. 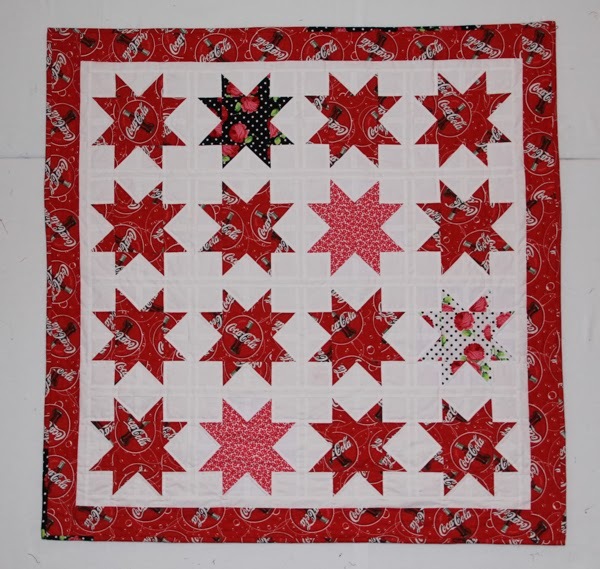 I love this pattern because it's so simple! 4.5" x 6.5" focus fabric with a 1.5' by 6.5" strip on each side. When you alternate the blocks and then but a border around it you get a woven effect. 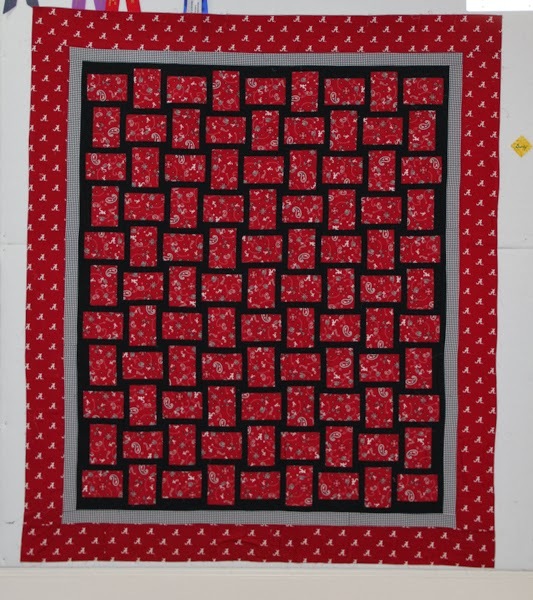 I'm using this pattern for the fifth time on this quilt. I think I'll have it ready in record time. 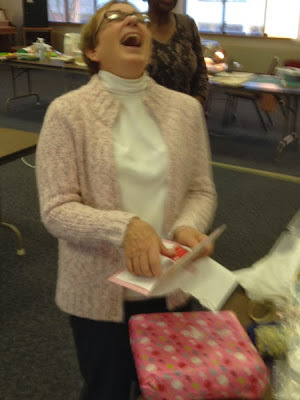 I am linking up to Barbara's Linky Party. Go take a look at all the NewFo's started this month! 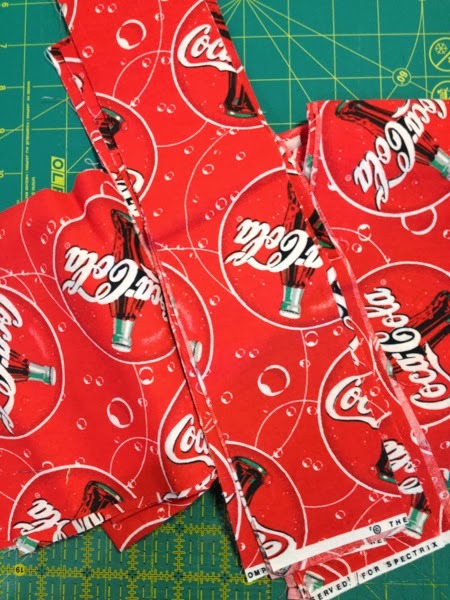 I just fell in love with this fabric so I had to make a matching pillowcase for Aemarys's quilt before I put it into the mail to her. It's from the "Keep it Sassy" line by Moda and comes in several other colors. The Cotton Candy pink is from the tried and true Kona Solids which I usually buy from The Fat Quarter Shop. You can get just about any color you want in that line! 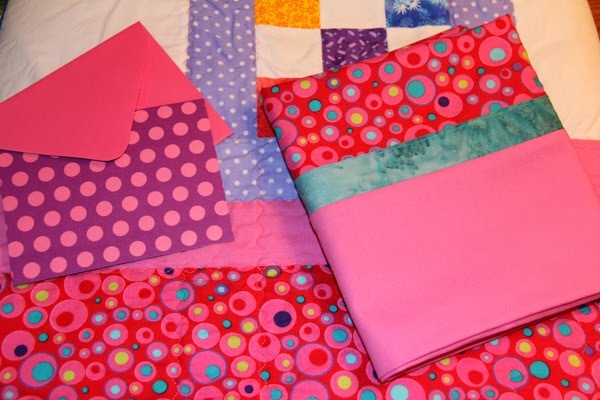 Can you believe I even found a purple and pink dotted note card to include? I put it into a big plastic storage bag, then packaged it and shipped it out earlier this week. She might even be sleeping under it tonight.